Even if your gift list seems like it''s endless this year, sending anyone a sweet holiday gift is beautifully easy. This basket is fresh, festive and fabulous. Oh, and did we mention delicious? 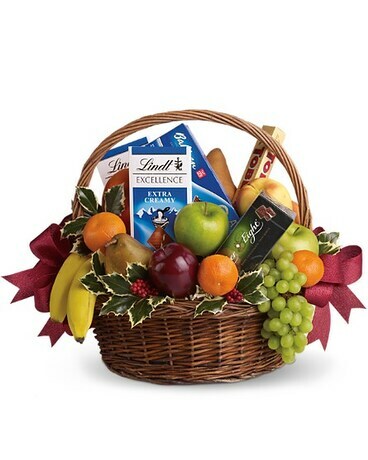 Fresh green, red and yellow apples, bananas, grapes, pears and tangerines are arranged with an assortment of gourmet chocolate bars and cookies. Add Christmas holly and red ribbons and you''ve got one heck of a healthy Christmas gift. Approximately 19" W x 16" H.